A map of rainfall totals as of 2 p.m. Tuesday, Sept. 11. Courtesy of National Weather Service. George Stevens Academy students Harrison Walden (left) and Theo Lesko walk home in the thickening fog in Blue Hill after soccer practice Tuesday. Heavy rainfall for most of the day was replaced by fog in much of Hancock County. Remnants of Tropical Storm Gordon have likely alleviated drought conditions that have dogged coastal Maine for most of the summer. Tuesday’s rainfall dumped three to four inches on most of Hancock and Washington counties, with a statewide high of 5.46 inches reported at Cadillac Mountain in Acadia National Park, said Francis Kredensor, a meteorologist with the National Weather Service in Caribou. 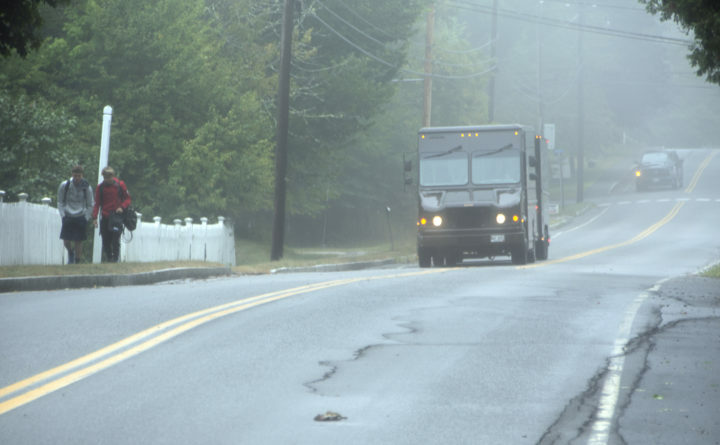 The rainstorm was borne on a low-pressure front carrying what remained of Gordon’s moisture into the Gulf of Maine into Maine on Monday night, said Mark Bloomer, a meteorologist at NWS-Caribou. Gordon made landfall Sept. 4 just west of the Alabama-Mississippi border, with sustained winds of 70 mph, just below hurricane-force. But the storm that flooded and knocked out power to much of the southeastern U.S. coast has been a tonic to Mainers. 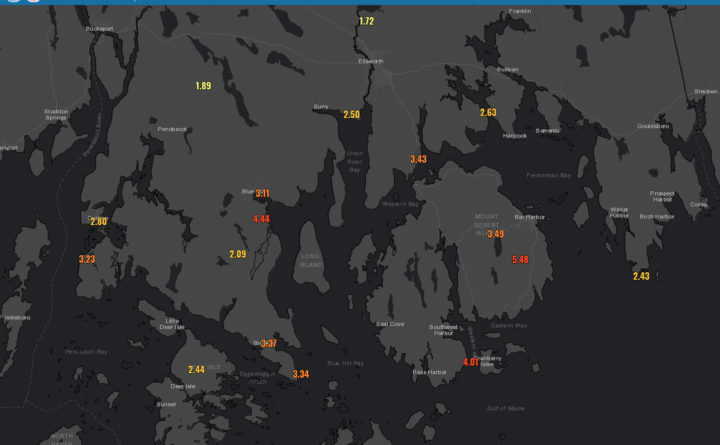 Bangor International Airport reported .86 inches, Bar Harbor Airport in Trenton had 3.43 inches, Southwest Harbor had 4.01 inches reported at its seawall and Blue Hill spotters observed 4.4 inches as of 2 p.m., Kredensor said. 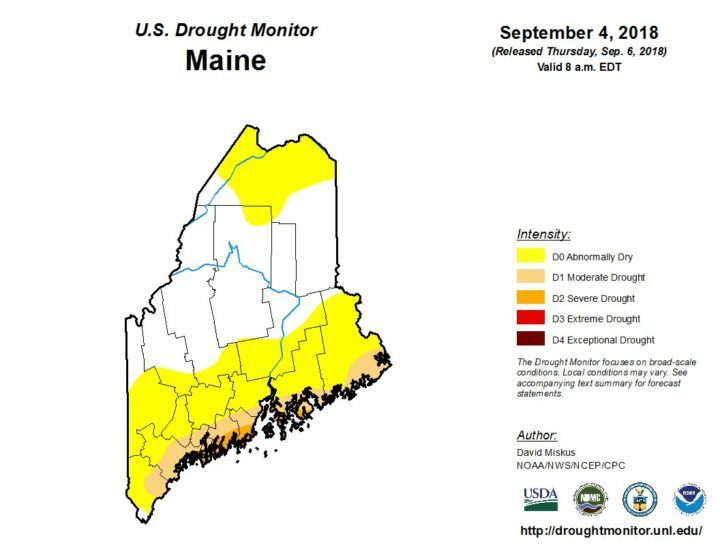 Drought conditions have existed from Lincoln County to Eastport for several weeks, with abnormally dry conditions reported in the southeastern half of the state to the southern Piscataquis County line and in northernmost Aroostook County, according to a National Weather Service map. Tuesday’s storm will peter out by midnight, and clear skies are expected for the rest of the week. High temperatures will run in the mid 70s to low 80s in northern Maine until Sunday, with slightly cooler conditions likely along the coast, Kredensor said. A weak cold front might move in Monday, he said.